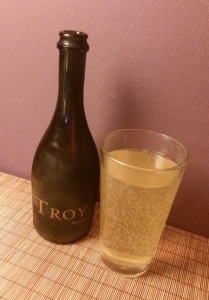 When I was at my local liquor store looking for something I haven’t yet tried and reviewed, the beer & cider buyer happened to be there, chatting to some other customers, and upon his very strong recommendation (produced in its turn by the strong recommendation of others that he try it) I picked up a bottle of Troy. They’re apparently only on their second year of cider — the first year they took what they could get from around the accessible outside of an old fruit orchard and this past year they were able to get in and reach the interior. The cider is barrel aged and wild fermented, and I noticed a considerable amount of sedimentary sludge in the bottle of the bottle. My first whiff was sharp and acidic, almost vinegary. The cider is a light yellow, more or less cloudy depending on how much of the sediment you rustle up. I leaned toward trying not to disturb it. Little did I know that that whiff of vinegar was only the prelude to a much stronger sourness and acidity in the taste of the cider. This stuff is aggressive. It’s so strong that it’s hard for me to pick out any individual notes in this — it’s a different sort of cider to be sure, and I don’t know how much of that comes from its heirloom apple/pear/quince composition and how much comes from the wild fermentation. To be honest, I flat out cannot recommend this cider. I suppose if someone was already a fan of drinking actual vinegar, they might like this cider, but other than that, pass. Maybe I just got a bad bottle? I checked out some other reviews and they give quite a different impression of this cider. If you’d like to take a gamble, or you are one of those people who likes drinking vinegar, you can keep an eye out, but if you ask me? Just don’t. This entry was posted in Cider and tagged 500mL, motorcycle wineries, troy cider. Bookmark the permalink.